Introducing the Charles Hubert, Paris, Triple Time Zone Watch, the ideal watch for an international pilot, military personnel, any world traveler or the person with family or business contacts in several different time zones around the world. 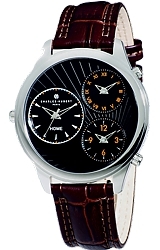 The Charles Hubert, Paris, Triple Time Zone Watch may be one of the most unique watches ever created. 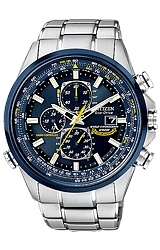 These watches actually have three separate timekeeping mechanisms that operate independently. Each watch movement can be adjusted to a different time zone without affecting the other two. The model XWA4800 features an easy-to-read black dial and a handsome Genuine Leather Calfskin Strap.